The hotel provides a free shuttle bus service between Phoenix City Hotel and Canton Fair Complex. The ride takes around 15 minutes. For admission to the Autumn Canton Fair, Buyer Cards can be registered in the hotel. Please note that rates for an extra bed with or without breakfast will differ during the Canton Trade Fair period. The hotel offers free pick-up service from the airport or from East Railway Station during the Canton Trade Fair period only. Please contact the hotel directly for more details. The luxurious Phoenix City Hotel is located in Guangzhou, a 20-minute drive from Pazhou Exhibition Center. It features 2 swimming pools, a fitness centre and rooms with free internet. The elegant rooms at City Phoenix Hotel come with balconies that offer views of Phoenix Mountain or the city. Each room is well-equipped with a minibar and TV. Hot shower facilities are in the en suite bathroom. The hotel boasts a stylish lobby modeled after the Sistine Chapel. Guests can visit the spa for a massage or play a game of tennis. Daytrips and sightseeing arrangements can also be made at the on-site tour desk. Featuring French décor, Vienna Restaurant offers a buffet breakfast. Other dining options include Cantonese dishes at the Chinese Restaurant and refreshing beverages at Mona Lisa Club. Hotel Phoenix City is a 20-minute drive from Tianhe District and a 45-minute drive from Guangzhou International Airport. 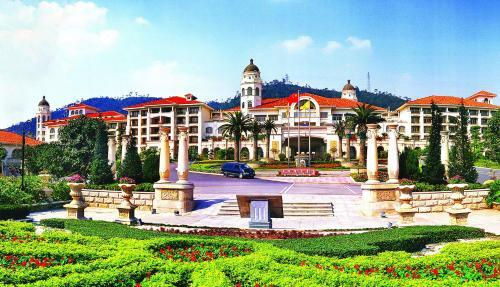 Guangzhou Phoenix City Hotel - South China to the vast landscape theme-style hotel. Phoenix hotel perched rings lush mountains, facing of Green Lake. Phoenix City Hotel covers an area about 200000 square meters, with its accompanying ... There are 600 spacious rooms of various sizes in the Phoenix City Hotel.